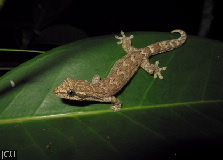 These introduced geckos are all related and all populations are female. They are often seen in buildings. Distinguished by the pale, zigzag or W-shaped markings in rows along the back of the creamy-fawn body. Each of these markings is usually associated with a black spot which is more obvious on the tail than on the back. Markings only present on the original tail.